What a random question for a jailer to ask two prisoners. But these weren’t just any two prisoners. Paul and Silas had been arrested, flogged, and thrown into a prison cell, yet with their feet in stocks, they were “praying and singing hymns to God” (Acts 16:25). As if their behavior wasn’t strange enough, an earthquake shook the prison, causing every prisoner’s chains to fall off, but remarkably, no prisoner fled. After all, this guard’s life would have been on the line if they had. No wonder the jailer wanted to know how he could be saved. When we worship in the dark as Paul and Silas did — in the midst of pain, loss, fear, uncertainty, sickness, or death — people notice. When we bless the name of the Lord, whether He gives us the desires of our hearts or takes something precious from us, people notice. God can use our praise to move in their hearts, and we may find their voices joining ours in heartfelt worship of the one true God. Does prayer seem useless to you? Perhaps you see others’ prayers answered time and again while yours remain unanswered. Maybe you find yourself thinking, God has everything set in motion to accomplish His plan, so what’s the point of praying? It won’t change His mind. Jesus feels your pain. Jesus’ prayer in the Garden of Gethsemane failed to change God’s mind. Jesus knew God’s plan was set in stone before He prayed, but it didn’t hinder Him from pouring out His heart until He sweated drops of blood. Through humbling Himself in prayer, Jesus surrendered to the Father’s will. In turn, I believe the Father instilled in Him the courage and strength He needed to accept the horrific death on the Cross. Keep fervently praying and asking God to answer your prayers. Even if He doesn’t answer the way you had hoped, He will give you the courage and strength to face whatever challenge is before you. 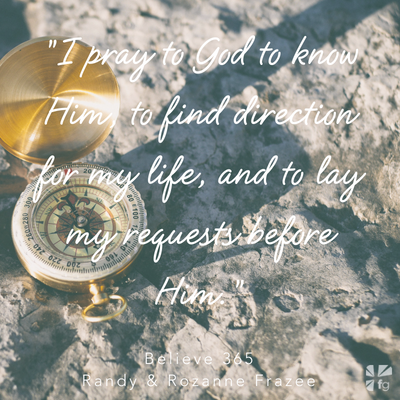 Excerpted with permission from Believe: 365-Day Devotional by Randy & Rozanne Frazee, copyright Randy and Rozanne Frazee.